It's a tried and true way to soothe baby's sore gums. Teether-pillar is a water-filled teether that can be chilled in the refrigerator to add extra soothing relief to baby's tender gums during teething. 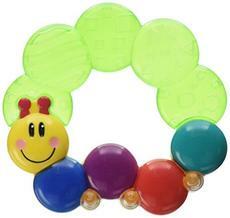 The beloved Baby Einstein caterpillar is easy for little hands to grab and hold. Great for at home or on the go.